I moved to Seattle in 1997, after growing up in Portland and going to school in Washington D.C. My first two priorities after finding a place to live were: (1) buying Seahawks season tickets (2) subscribing to the Seattle Post-Intelligencer. Reading the paper every morning has been a ritual for me since I was eleven-years-old. 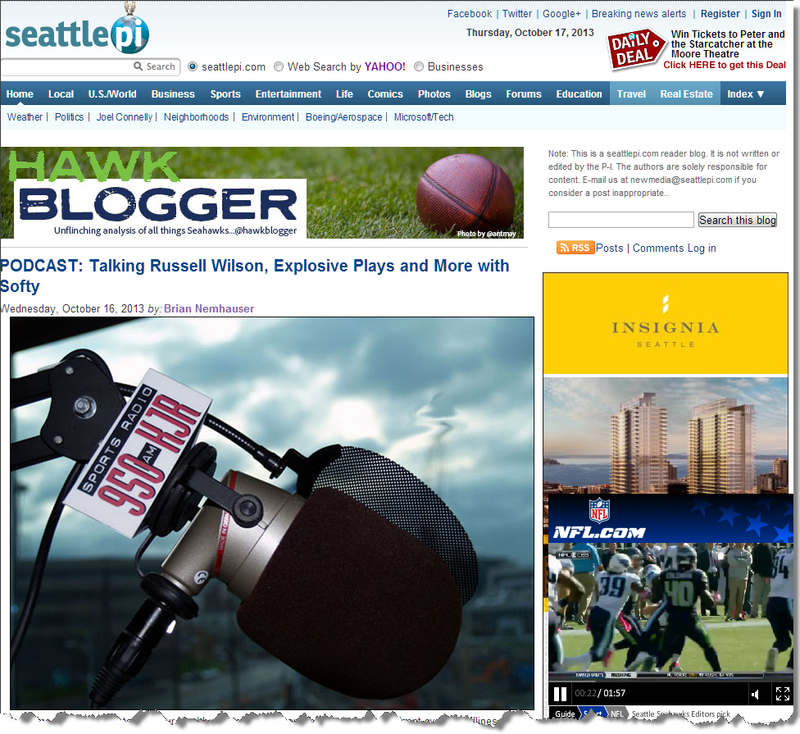 My obsession with Seahawks football was a large part of what drove that routine, and eventually led to the creation of HawkBlogger.com in 2007. The site has grown from a scant few readers to a place where thousands of people come every day to get Seahawks analysis that is just a little bit different from anyplace else on the Web. It never occurred to me when I started my Seattle P-I subscription or started HawkBlogger.com that they would one day cross paths. Today, I am excited to announce an agreement has been reached that will allow P-I readers to get Hawk Blogger content from within the friendly confines of the SeattlePI.com web site. This agreement will provide P-I readers with unique analysis of their favorite football team and help HawkBlogger.com reach a broader audience. 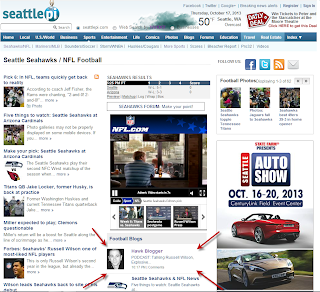 Readers can find Hawk Blogger content within the sports section, under Football Blogs. Articles will appear there a short time after being published on the Hawk Blogger site. A big thank you to Nick Eaton, sports editor and writer over at SeattlePI.com for reaching out and working overtime to make this deal possible. He does some great Seahawks writing of his own, so be sure to check out his work on the Seattle P-I web site as well. And give him a follow on Twitter. For those of you that already read my blog, nothing much changes here. HawkBlogger.com stays right where it is, and I write whatever I want, whenever I want. Stay tuned for news on a re-design underway on Hawk Blogger as well that should help you navigate the site better, and have a better reading experience on mobile devices. I am also very active on Twitter. Too active if you ask me. Please consider following me there. Thanks to all the loyal readers who helped make this blog matter, and welcome to all the new readers who love the Seahawks. Go Hawks! 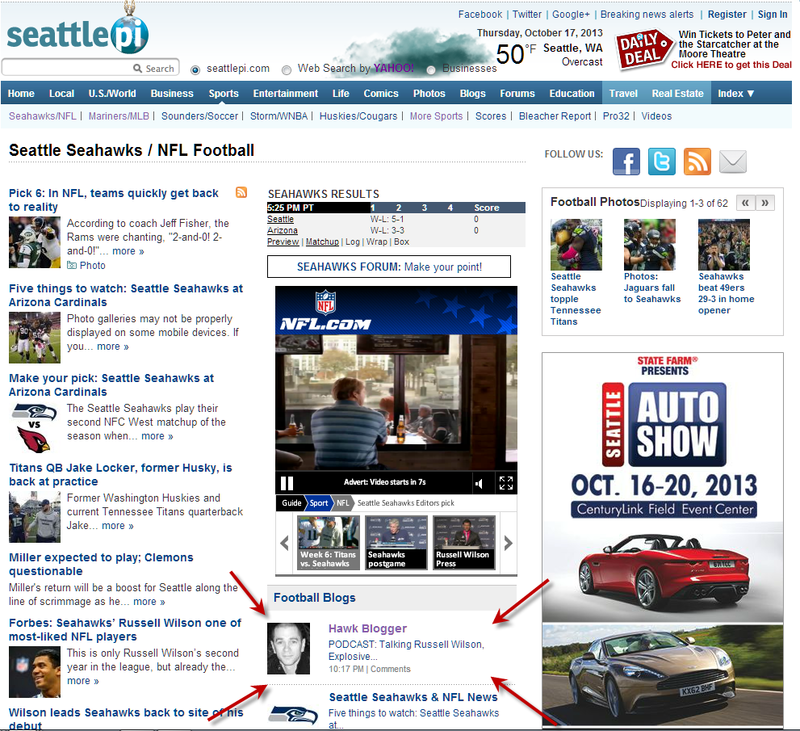 More Great Seahawks Coverage: Seahawk Addicts & HawkBlogger Join Forces!